Bathing is one of the most important parts in grooming. 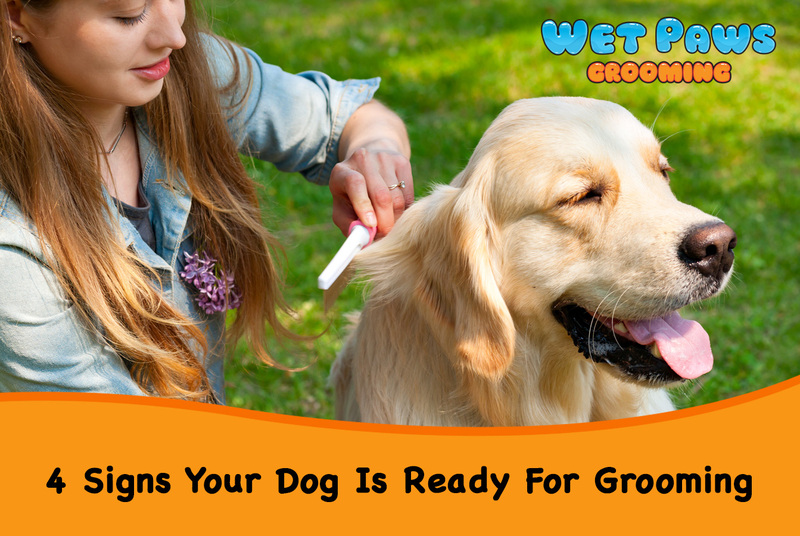 Dogs need outdoor activities, and that means they will accumulate dirt and debris on their coat. If your dog get dirty, it’s better to take them to a groomer so that they can help to remove the debris and dirt and improve the coat’s shine by using specialized products. Also, for those dogs with skin problems, they may require specific instructions for bathing and a professional groomer will certainly do a better job to keep your dog clean and healthy. Sometimes it might not be that easy to notice the need for a bathe based on appearance, especially for dogs with dark tone hairs. But you can certainly notice the smell when you hug or play with your dog. There are many reasons for a bad smell, the most common one is mouth odors caused by tooth infection. Another reason is skin fold dermatitis, mostly found in Pug, Bulldog or Spaniel breeds. So take your dog to a groomer regularly so they can help you brush your dog’s teeth and help with cleaning the skin in the right way to prevent any infections from happening at first place. Watch for your dog’s nails, as long nails could hurt themselves or you. Also from time to time, check your dog’s paws if they have a medium to long coat, because they may grow extra hair between their footpads,. During winter time, dirt and road salt can get packed with ice in their paws, which all will cause uncomfortable feelings for them to walk. Just keep in mind that some dogs may get anxious when you try to trim their paws and nails, so if you are not confident doing it yourself, ask a professional groomer for help. For dogs, long hair with undetermined length must be cut on a regular basis, otherwise it will lead to a matted coat, putting the dog and owner in a misery situation. Mats happen when dogs are continually shedding their dead hairs and those hairs would be left in the coat, causing small mats to form. Later on as new hairs keep growing, mats can occur very close to their skin. It’s especially important during wintertime, when dry coats are more easily matted. Regularly check your dog’s coat, especially on sensitive areas like back of ears and legs, and if you notice there are mats, then it’s time to give your dog a grooming. Grooming your dog as often as required will keep them healthy. Mats and debris on coat will cause skin irritation and infection due to lack of airflow and moisture that is trapped underneath. Take care of your furry friend by keeping them clean and comfortable. If you ever feel confused or troublesome to do the grooming by yourself, don’t hesitate to contact a professional mobile grooming service like Wet Paws Grooming in Los Angeles. We will come right to you and make your dog shining again!